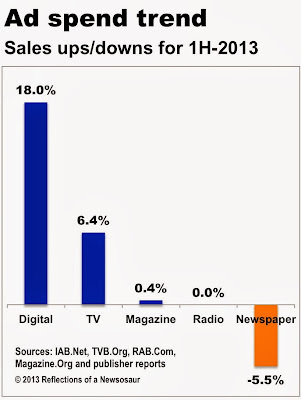 As digital advertising sales soared 18% to a record high in the first six months of this year, the revenues of the publicly traded newspaper companies slipped an average of 5.5% to enter an eighth year of unabated decline. Paced by a 145% increase in mobile ad sales, digital volume hit a half-year high of $20.1 billion, according to the Interactive Advertising Bureau, a trade organization. The sum is nearly equal to the $22.3 billion in sales collectively produced by the nation’s 1,382 dailies for all of 2012. Assuming digital and newspaper sales pursue the same trajectory for the balance of the year, then digital revenues for the full 12 months will be more than twice the revenues produced by newspapers, whose aggregate sales hit a record $49.4 billion as recently as 2005. In a measure of the dizzying pace at which the marketplace is shifting, interactive revenues were $12.5 billion in 2005. As illustrated in the chart below, the growth in digital advertising is taking oxygen from the other legacy media, too. While broadcast television sales grew by 6.4% in the first half of the year, magazine sales gained 0.4% and radio sales were flat. The data were provided by their respective industry associations, the Television Bureau of Advertising, the Association of Magazine Media and the Radio Advertising Bureau. In the absence of information formerly reported by the trade association representing the newspaper industry, the 5.5% decline in publishing revenues is based on an analysis of the financial statements of the 10 publicly traded companies that own domestic newspapers. The revenues of the group, which includes A.H. Belo, Gannett, GateHouse Media, Journal Communications, Lee Enterprises, McClatchy Co., New York Times Co., Scripps, Tribune Co. and the Washington Post Co., represent about a third of the nation’s newspapers. Because their holdings collectively include everything from tiny weeklies to some of the largest metros, the performance of the group probably is a fair indicator of where ad sales are going. But it will take until next spring before we know for sure, because the Newspaper Association of America has stopped producing the quarterly revenue reports that had been chronicling the stubborn revenue decline that has been under way since April, 2006. Although the association’s online archives contain sales data dating back to 1950, the quarterly revenue reports produced by the NAA since 1971 are not going to be updated any more, according to Brooke Brennan, a spokeswoman for the association. NAA is switching to an annual report to provide a more comprehensive report on the industry.